ICDP funds parts of the operational, drilling and drilling-related costs of approved projects. A considerable share of operational funds has to be raised from non-ICDP sources such as national funding agencies, industry, academies, universities and so on. 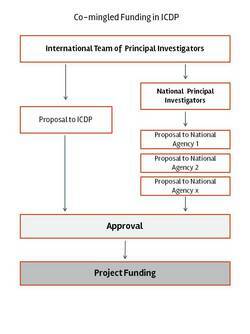 The Principle Investigators of project proposals to ICDP are expected to balance ICDP and other sources well. Funds for post-operations science has to be borne from outside ICDP. ICDP will fund workshops with typically up to $50,000 to cover travel, lodging, meals and meeting rooms for invited scientists. Third party funding for workshops through e.g., universities and other institutions are welcome but are per se not necessary. The amount of ICDP funding is variable and not fixed. However, proponents should take into consideration that the annual program budget is approximately $3.5M and that ICDP expects to fund a mixture of project sizes and types (workshops, full proposals) each year. As such, while there is no formal limit on the budget of a full proposal, in general projects tend to be at most $1.5M. If you wish to exceed this guideline figure, then please get in touch with ICDP to discuss.